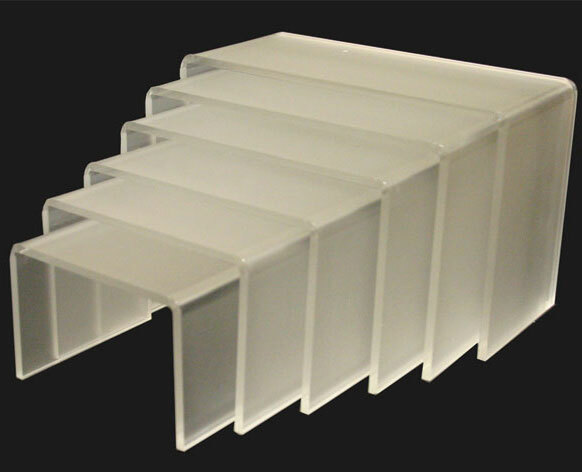 Acrylic Risers (Shelf Displays)....anyone interested? If anyone is interested, just reply to this thread. In the mean time I'll find out actual dimensions. I should be able to get a discount the more that I order. Re: Acrylic Risers (Shelf Displays)....anyone interested? you know, I'd be all over this if they were all a uniform size. Having varying sizes is a little bit of a turn off. I'd be interested in acrylic steps as it saves me having to make them myself. I don't need any risers at this stage but would be interested in checking them out for future orders - I need them to be sturdy and non-flexing for mini busts. little bit to small for 6inch figures i think & the step up between each step is not enough. And its a store here in Granville, about a 10 min ride for me, so i'll be paying them a visit tomorrow! have you got an address for this by any chance? Deceptic_Optics wrote: have you got an address for this by any chance? Its gone unfortunately, ive tried a few times to contact them with no avail, but as per the other thread i did find better stands and they are available to purchase through myself!